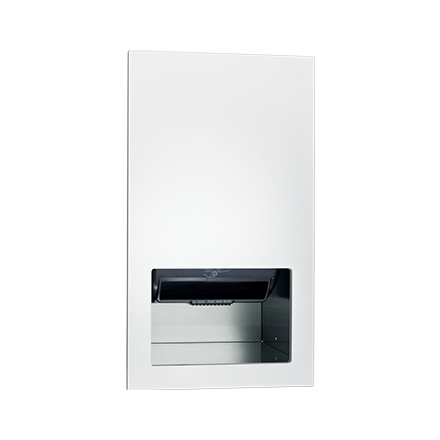 This sophisticated automatic paper towel dispenser is designed to be completely recessed into the plane of the washroom wall, highlighting the seamless design that defines Piatto™. The phenolic door is attached to the cabinet using field-adjustable, furniture quality hinges and is secured shut by an internal spring-loaded latch. All hardware is concealed giving the Piatto™ Collection its minimalist appeal. Proximity sensing no-touch unit holds and dispenses one 8″ diameter [Ø203] x 8″ wide  standard towel roll up to 800 ft. (244m) long and one 8″ wide  stub roll up to 4″ diameter [Ø102] and automatically changes over to main roll when finished with stub roll when feed tabs are properly engaged. Dispenser is powered by AC plug-in adapter – C-UL-US and CE approved internal low-voltage adapter (supplied) using 110- 240VAC, 50/60 Hz and providing output of 5VDC @ 1A and operates automatically to activate towel dispensing when hands are placed in sensor zone. At each activation unit feeds out a length of towel selected by owner by setting length, delay and paper saver switches.